Welcome to the latest edition of Who’s Making Money. 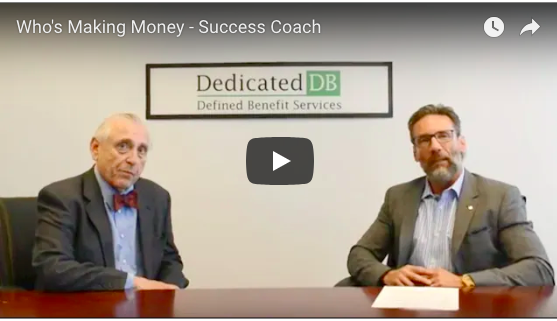 In this video, learn how this Internet success coach earned high income and how a defined benefit plan helped her save big on taxes and build wealth. Jeff: Welcome to the latest edition of “Who’s Making Money?” Hi, I’m Jeff Biesman and I’m here with Phil Pirio in Los Angeles, California. Phil is a Senior Plan Design Consultant at Dedicated Defined Benefit Services. Phil: Thanks, Jeff. Hello everyone. My associates and I at Dedicated DB, work with Financial Advisors nationwide to design Traditional and Cash Balance Defined Benefit plans for high income self-employed people and small business owners in order to help them hold on to more of what they earn and plan for retirement. Jeff: Phil, I absolutely loved hearing this latest story you shared with me earlier because it illustrates two important things that seem to be happening right now. Many people are using the reach and power of the internet to build businesses and make a lot of money. The labor market is really changing and there are more and more “non-traditional” roles that are flourishing in this new “digital economy”. Phil: You’re right Jeff. When I first started in this business 15 years ago most of the high income self-employed clients and their financial advisors were from traditional vocations i.e. doctors, lawyers, architects, dentists, and even farmers. We still help them. But the presence of the internet has really changed the dynamics of income generation to the point where many of our clients are growing great businesses through the digital economy. The latest example is an internet millionaire who provides business and life coaching specifically for women who want to make more money. 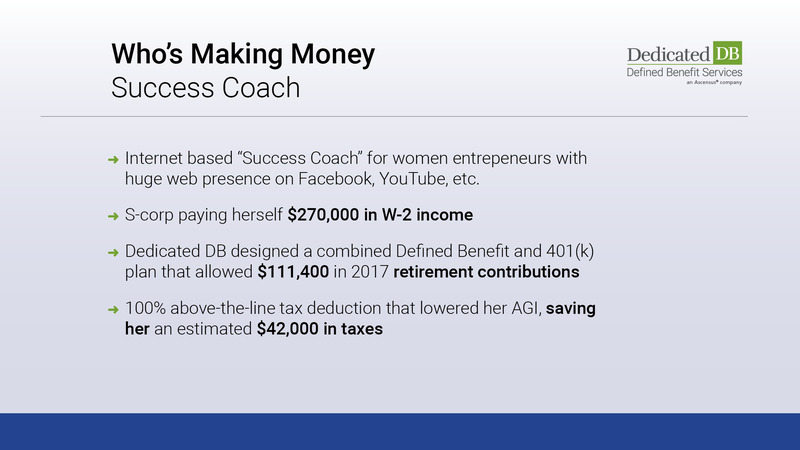 This “success coach” for women entrepreneurs started her business just a few years ago and has helped thousands of women successfully launch their own businesses! Jeff: She’s basically a business and life coach for women – right? I checked out her web presence a few minutes ago and it looks like she’s all over Google, Facebook and YouTube. When someone has a good digital presence that can be a leading indicator that they are making some real money. How exactly did she find us and how did we help her? Phil: A financial advisor who has opened several defined benefit plans with Dedicated DB before brought her to us at the end of 2017. Her income went through the roof – soaring over $2 million when we spoke. She has an S-corp and paid herself $270,000 in W-2 income – which was the maximum that could be included as compensation for a retirement plan in 2017. We were able to design a combined defined benefit and 401(k) plan that allowed her to contribute $111,400 to her retirement for 2017 and save an estimated $42,000 in taxes. In 2018, she will be able to save even more. Jeff: Phil, it’s really a remarkable story and I love how defined benefit plans helped her save so much on taxes. Phil: Yes, it is. And, again, it really illustrates the unique ways people are making money in our new digital economy. If you’re a financial advisor and one of your clients fits this profile, or if you are an internet entrepreneur, and would like to reduce your current tax bill, contact us right away. Talking to us early on in the year increases our ability to help you set up a high contribution retirement plan this year, and perhaps leverage some of the attractive deductions of the new tax law.